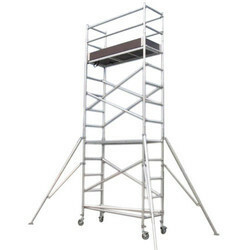 Pioneers in the industry, we offer aluminum scaffold tower with stairway, aluminum scaffolding for tanks, double width scaffold with stairway for hire, mobile aluminum scaffold tower with stairway, quickfit mobile aluminum scaffolding and tanks aluminum scaffolding from India. 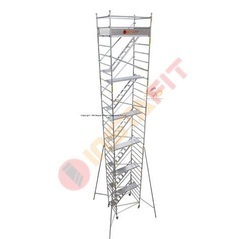 Single Width Scaffold Without Stairway for rental purposes. Step made up of 50mm OD 2.5mm thickness. Non slip, extra grip flat corrugated mullion steps. We are prime manufacturers fine quality H Frames which are made from fine quality steel with high tensile strength. These can be adjusted in its height for the required job and have scissor braces which are attached through gravity locks to prevent any mishap or breakage. 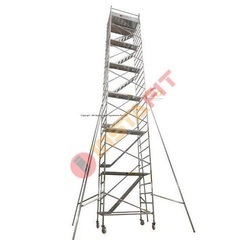 By utilizing one size or a combination of varying sizes of H Frames, towers or an array can be erected to the exact height required for the job. It is extremely easy to use and adjust even by a non expert which has no real training. 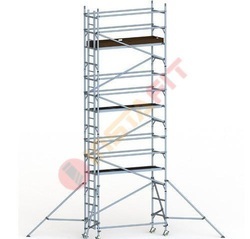 Our company is one of the leading companies that offer a quality range of Aluminium Mobile Scaffolding. 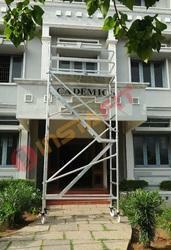 These Scaffolding are well designed by the team of skilled engineered and efficient workers of the industry. 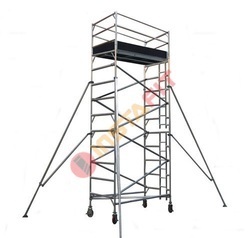 Aluminium Mobile Scaffolds are dimensionally accurate and ensure long lasting service life. Moreover these convenient to use and are used in construction areas.